Open last year in Iowa City, the University of Iowa Voxman Music Building is a six-story, 184,000-square-feet academic building containing performance spaces, a music library, practice rooms, classrooms, and faculty studios and offices. It establishes a connection between the community and the school though specific massing articulation and building envelope detailing. LMN Architects credited their collaboration with W.J. Higgins (envelope), Weidt Group (energy consultant), Jaffe Holden (acoustics), and Design Engineers (MEP) with ultimately delivering a high-performance acoustic and energy-saving building envelope design. Among other awards, the building recently received the 2017 Excellence in Energy Efficient Design Award at at the 2017 AIA Iowa Convention in Des Moines. Throughout the Voxman Music Building, the project team created an array of bespoke systems that responded to unique challenges presented by the complexity of the building type and programming. 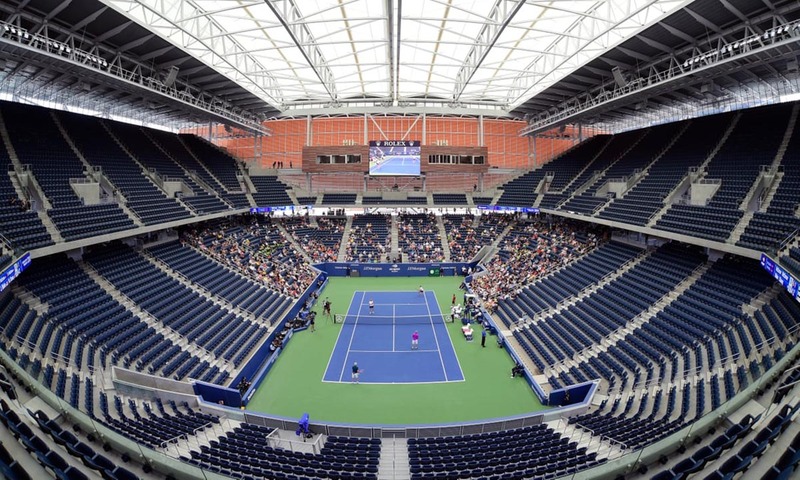 From facade components to acoustic systems, LMN worked to optimize the often conflicting needs of acoustic performance, aesthetic quality, and constructability. One of the most recognizable elements of the building design is a cantilevered “shingled” glass wall, containing a recital hall for students. Exposing this space, and expressing its function to the surrounding area, was central to the connective ideology of the project. It is here that students, in the words of LMN partner Stephen Van Dyck, learn about the art of performance. Prototyping scale models developed by the architectural team helped establish constructability goals and manage contractor bidding on the job. “We found that if we could build the design through models, it became much easier to have a discussion with contractors about our intent.” The unique facade was constructed as a series of rectangular units that produced a gridded, cantilevered steel frame for individual glass units to sit within. Aside from the shingled glass recital space, all other performance spaces were clad with a unitized terracotta system. The baguettes were composed of variable combinations of textures (smooth and grooved) and glaze finishes (matte and glossy). The resulting effect was a dynamic surface quality capitalizing on variable daylight conditions, including what the architects noted as exceptional sunrises and sunsets. 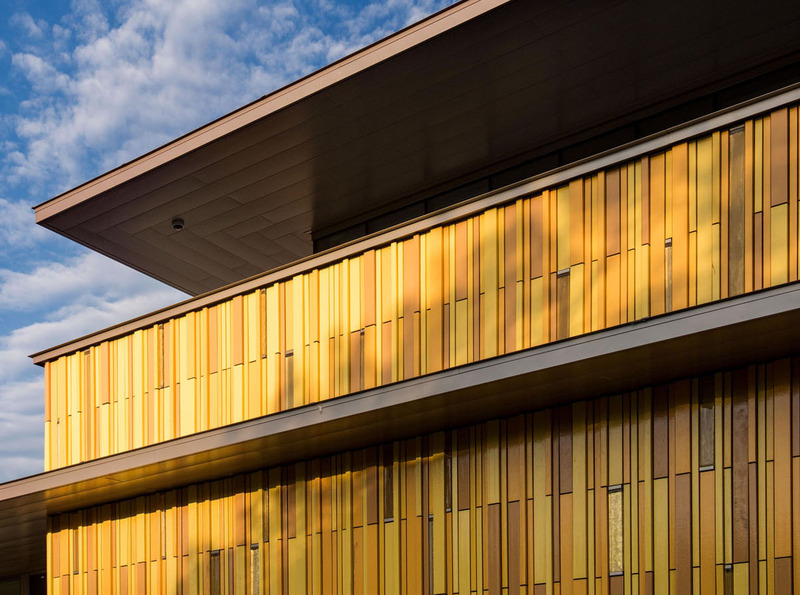 Van Dyck said this idea of variable form and finish options within a base cladding material was one of the successes of the project and ended up guiding future facade designs, one of which is currently under construction. 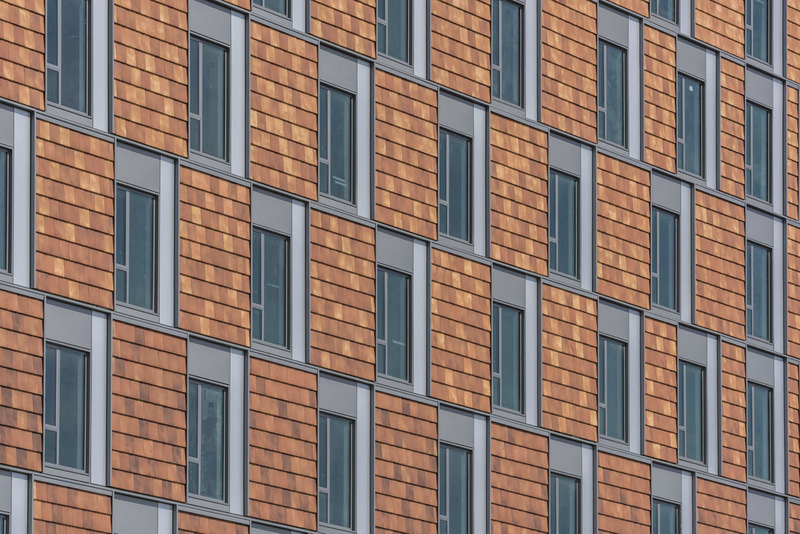 At key moments, terracotta cladding tiles formally twist into vertical fins. These moments accentuate a break between major program elements within the building. To ensure the accuracy of the complex form, the architects worked with the terra cotta manufacturer to develop a jig in which the extruded clay would be slumped, dried and later fired. “Buildings need to read at a variety of scales,” said Van Dyck. At a distance, the facade of Voxman reads at a solid/void compositional level. The medium scale allows for a reading of how program in the building is dispersed, through the cladding and aperture distribution. At a detail scale, the shimmering quality of varied terracotta tiles becomes legible. LMN’s Tech Studio, a small team within the firm, was integrated with the project team from the beginning of the design, playing a central role in the rationalization of surface geometry and interior acoustical surface detailing. Combining research in acoustic properties, material science and manufacturing processes, Van Dyck said the team approached each opportunity with a similar toolkit. Parametric modeling was central to the pursuit, enabling rapid ideation and precise geometric control despite vast complexity. In-house prototyping capabilities augmented the team’s abilities to test ideas well before finalizing documentation and procurement. Van Dyck said project opportunities often spawn unanticipated research problems that can be packaged to solve future design problems, and that the work from Voxman, which was completed last year, served as a basis for current and future projects. Further details can be found on LMN’s website documenting their acoustic related form-finding research and “Theatroacoustic System.” Van Dyck is co-chairing the upcoming Facades+ conference in Seattle, on Decemeber 8, 2017. More information about this conference and its participants, including registration details, can be found here. This week, the first building added in 60 years to New England Conservatory’s (NEC) historic Boston campus will open. The new Student Life and Performance Center (SLPC) is a ten-story mixed-use structure offering over 250 residential units, along with space for dining and music-related preparatory work with a focus on collaborative research and experimentation. Ann Beha Architects (ABA) and Gensler designed and realized the building as a collaborative and integrated team—the two firms’ fourth collaboration. Both the design team and the Conservatory wanted the project to have a unique identity and distinctive expression. Sited in a historic context, the design team sought a traditional cladding material that expressed craft, sustainability, and durability. 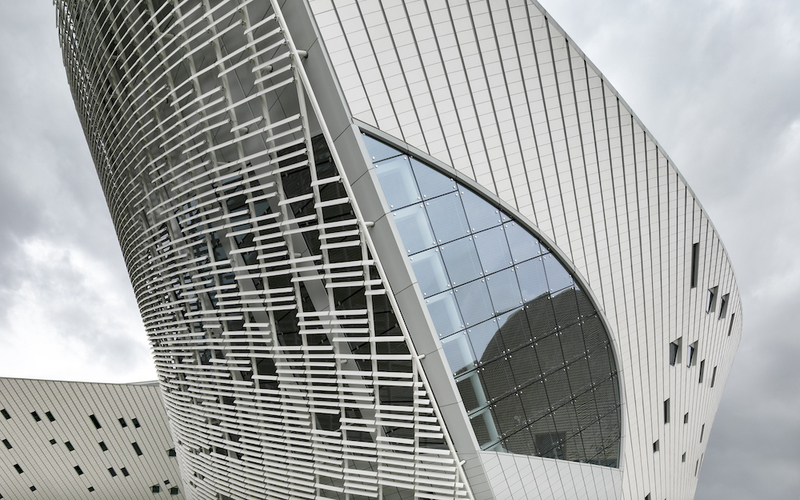 They prioritized a “handmade” aesthetic, ruling out the machine-like qualities of colored concrete panels, composite materials, and costly glass curtain wall systems. 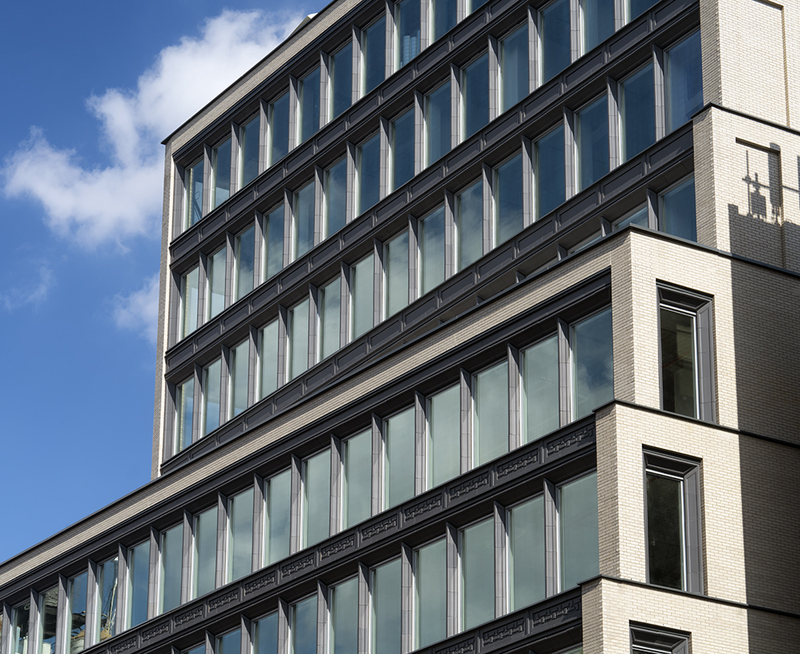 The exterior envelope ultimately featured a refined composition of variegated terra-cotta tiles, applied in mixed patterns, with broad glass expanses at street levels, and stainless steel screen cladding. Offset operable windows animate the upper floors, and north-facing open lounges offer expansive views of Boston. ABA turned to Ludowici, a terra-cotta manufacturer known for 19th century historic tile roof renovations. Its subsidiary, Terreal North America, engaged with the architecture team during the design process and produced samples for full-scale on-site studio mock-ups. The mock-ups became an integral part of the design process due to the custom nature of the tiles, their assembly system, and finish options, and helped to facilitate collaboration between the design team, client, and city oversight groups. “The idea of implementing this innovative facade was exciting for the Conservancy,” said Ann Beha, owner of ABA. “The fact that you couldn’t just go see something like this elsewhere meant that mockups were an essential part of the process.” The architecture team worked closely with Terreal North America to develop a gradient range of tiles that animate and anchor the building. 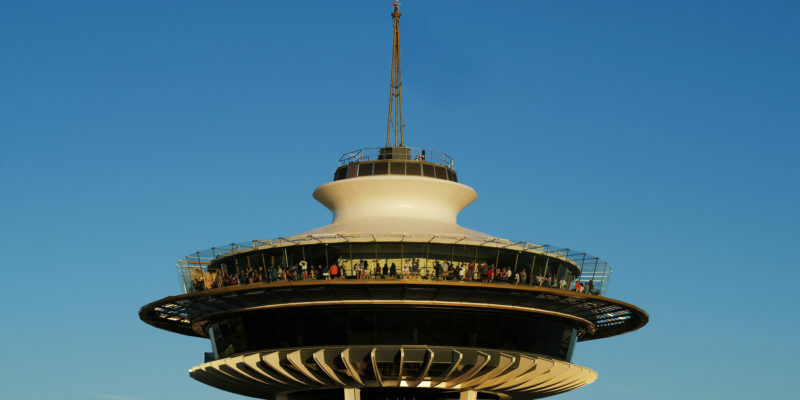 Deep tones located at the base of the tower give way to lighter hues as the height increases. The challenge became how to achieve this effect within technical and budgetary constraints. The team worked with three glazes, each with a wide variety of coloration. Percentages of these mixes were then varied. 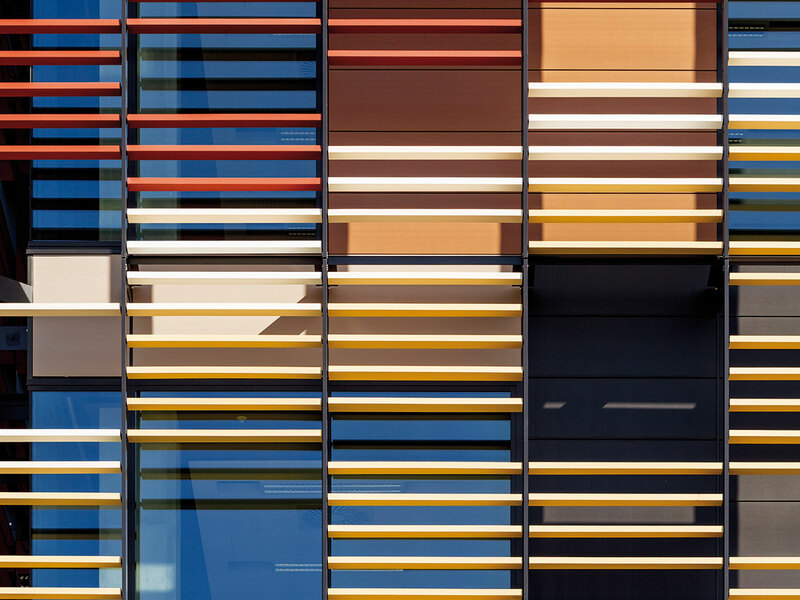 The architects developed a “paint by number” style document to specify the final distribution across the facade, which the installer referenced on site. 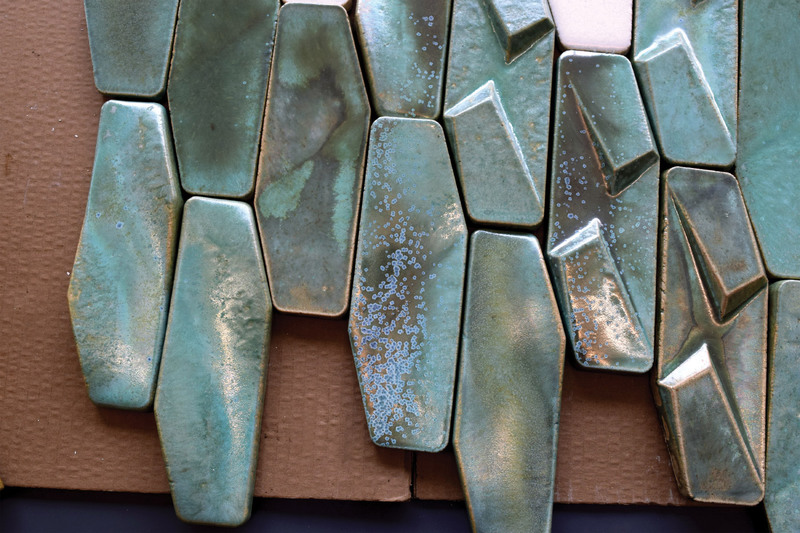 The unique color blends were created by a proprietary glazing process designed by Ludowici, referred to as their “Impressionist Series.” The process features a random multi-spray matte glaze application that creates a unique finish patterning on every tile. The colors chosen included Terra Cotta, Dark Terra Cotta, and a custom color. Distinguished from and responding to the terra-cotta tile, the facade of the performance center is marked by a 40-foot-tall metal screen mounted in front of the orchestra rehearsal room’s double-height facade. The installed Centria metal panels have a ridged profile that improves their structural capacity, and vertical shadow lines. 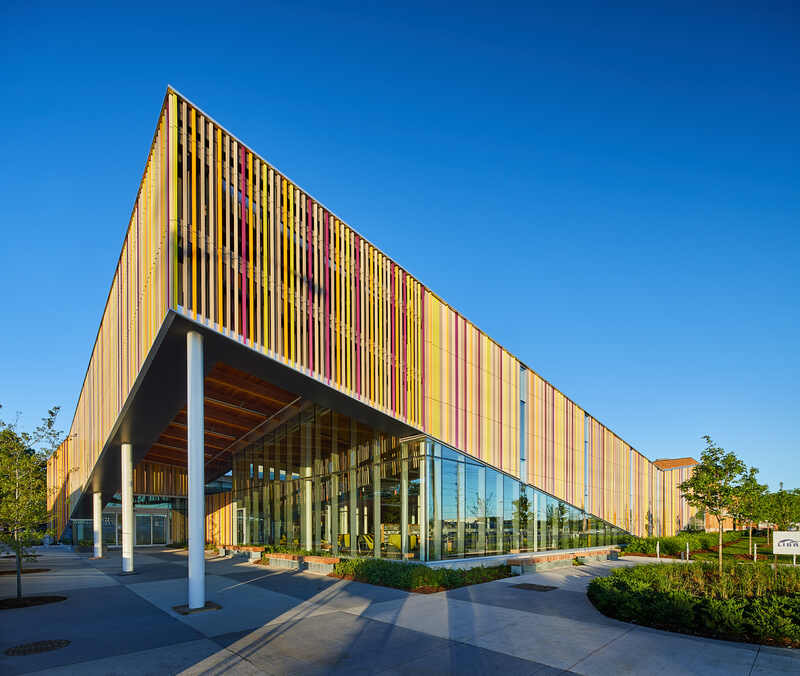 The material clads a radiused steel frame, reading as a vertical curtain that peels away from the building envelope to reveal the school's performance spaces. 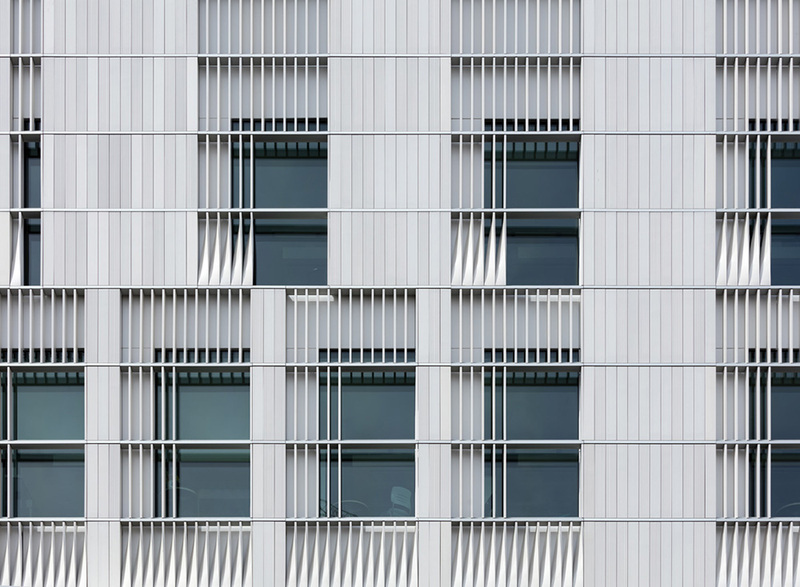 AN spoke to ABA about the composition and detailing of the facade, which is organized around variable window spacing that relates to the width of student dormitories. “We liked the idea of an inscribed horizontal line that acts visually as a datum that all of these shifting panels could relate to,” said Steve Gerrard, principal at ABA. “It becomes especially important where the windows increase in their frequency. The line is an important compositional tool to relate to each of the floors.” Beyond compositional refinement, the envelope's energy performance allowed for a reduction in HVAC system sizing. 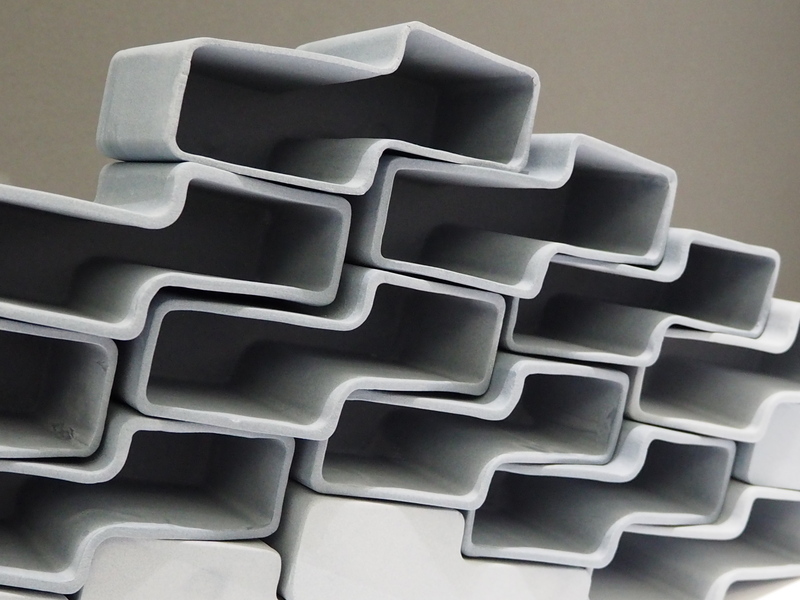 Beha said the durability and aesthetic quality of the tile rainscreen cladding was particularly successful. “We see concrete panel structures built all over Boston, and they seem to lose their color, and their quality, so fast. This will not.” Beha concluded, “For me, the painterly aspects of the result are consistent with the issue of urban identity and urban contribution. We wanted a facade worth looking at and considering, and one that brought NEC distinction, dissimilar from others, and enduring, simple, distinguished, in its own way.” ABA said the facade composition reflects the New England Conservatory’s own ambitions: creative, contemporary exploration that combines tradition and innovation. The project was dedicated in a ceremony on September 14th, 2017, and will open to the public the following week with a full day of programming involving performances and talks. Andrew Frontini, design director of Perkins+Will Canada, said the project team conceptualized the library as an urban oasis. “We wanted to create a colorful perimeter fence that lifts up to let people in. This screen speaks to both the richness of the community and offerings within the library. The idea of using color and very fine texture as something that materializes and dematerializes led us to use terra cotta." The architects said one of the challenges of the project was resolving two distinctly different facade systems to produce a cohesive wall wrapper that clads walls and screens outdoor spaces as it wraps the square volume of the building. “The challenge was to get everything to align, and to achieve a consistency of detailed expressions when in fact we were dealing with two very different systems." 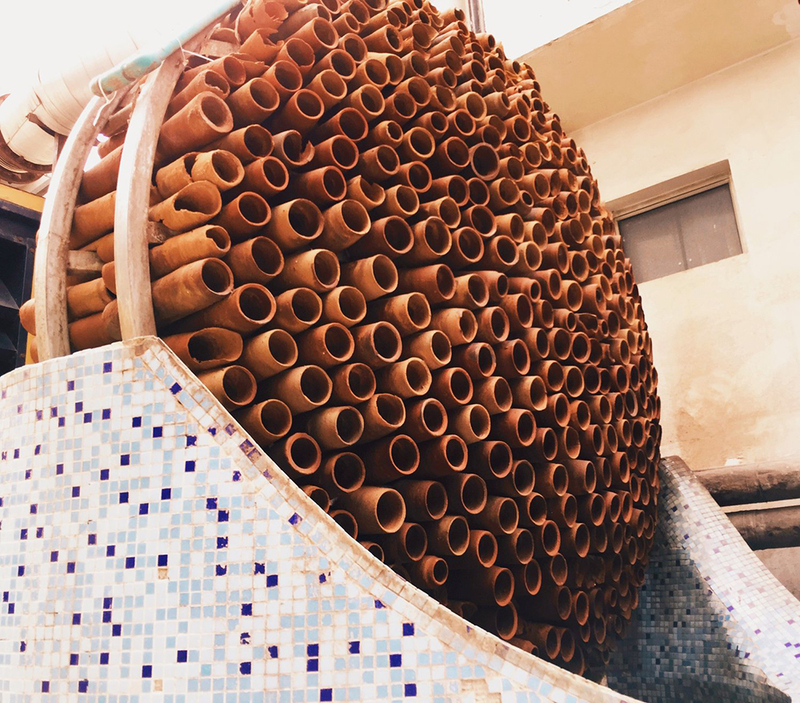 The primary wall assembly is a terra cotta rain screen composed of vertically-oriented hollow-cell tongue-and-groove planks around 3/4-inch thick. These planks are finished in an unglazed beige gray coloration, which acts as a background "field" for more colorfully glazed terra cotta baguettes that are mechanically fastened into a rhythmic patterning on the facade. The terra cotta cladding is mounted on stainless steel clips that provide attachment to a Z-girt system. About one inch beyond the terra cotta cladding sits a conventional rain screen assembly composed of rigid insulation, a vapor barrier, and sheathing over structural steel studs. At the courtyards, a second facade assembly picks up the terra cotta. Upper and lower flashing from the rain screen continues to this screen system, providing visual continuity between the two systems. This screen is composed of two-inch terra cotta baguettes set about two inches apart. The terra cotta is attached back to a steel HSS frame, set precisely to maintain a coplanar finish of terra cotta around the perimeter of the building. The framing allowed for terra cotta to be clad on both the exterior and interior side, which allowed for a more finished look to the courtyards for people using the library. Frontini said the project team very purposefully selected colors for the terra cotta. "We were looking at an array of colors that would be evocative of a floral garden. We wanted something that wasn't immediately apparent in the existing landscape—colors that were distinct from the urban setting, and vibrant so that in the winter the colors would help to animate the interior." Within the framed rain screen assembly, a series of punched windows are camouflaged as continuous vertical ribbons of glass by employing spandrel panels above and below the window opening. Below the terra cotta cladding assembly, which forms a sloped datum as it shifts upward to produce corner entries, a curtain wall system is utilized. This creates a nearly continuous band of transparent glazing around the perimeter of the library. Larger expanses of curtain wall are also employed to the interior side of the courtyards, helping to produce a more transparent separation between library and garden. Low-level radiant heating set into a recessed trench system is located at the curtain wall, helping to produce a draft stop and provide heating to patrons situated at furniture along the perimeter. Above, the library roofscape helps to manage stormwater through a green roof system that partially covers the roof, and through sloped areas which direct water into the landscaped courtyards below. "I find that the courtyards are quite magical,” said Frontini. “These pockets of greenery and color bring light deep into the building. Because of these spaces, it's very hard to be far from a window even though you are sitting in a 35,000-square-foot square."